I have to admit that I am incredibly envious of anyone who is now retired and enjoys gardening. My own manager retired in December and I am jealous of the amount of time he may (or may not?) spend gardening. He can pop outside whenever he likes and plan for his gardening year. Makes me greener than a courgette with envy! However, I work full time and that means crossing your fingers for decent weather at the weekend or wait until the clocks go forward and you get your evenings back, weather permitting. I'm sure a lot of working people feel the same way and it is frustrating if you plan to get back to your plot early in the New Year. 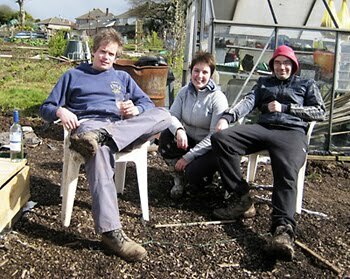 Unfortunately the recent winter weather has been particularly unkind for allotment maintenance. I could be planting garlic or even very early broad beans but I haven't seen the plot for weeks! First we had the coldest end to November ever and a bitter December followed by days of snow and travel chaos. As of January it's been rain, rain and more rain. Even if I could get to the allotment I'm sure I would slip and land face first into a big mud bath. I wouldn't need wellies, just a wading suit would do. When a dry day comes along, you can guarantee I'll be in work and won't be able to do anything. When the weekend comes along, it will rain. Sod's law. You just have to do what you can when you can and hope for dry, mild weather. I hope February is at least relatively dry and the ground is not frozen to the core! Fingers crossed! !